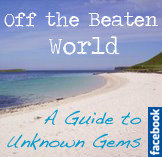 Welcome to Off the Beaten World, your guide to hidden treasures throughout the world. We hope to be able to help you find new places that normally you wouldn’t see because they are off the beaten track! To make this work, we hope that any unusual place that you, the reader, find, will be passed onto us, so that everyone can share in things that you would not have otherwise discovered.